CDS-Cogent Data Solutions Company Career Jobs Opening 2018-2019 Various Java Developer Posts Download Application at www.cogentdatasolutions.com. CDS-Cogent Data Solutions Career Job has Recently Announced 2018 regarding Java Developer & Various Job Openings Interested and Eligible Candidates can Download Application Through Official website. 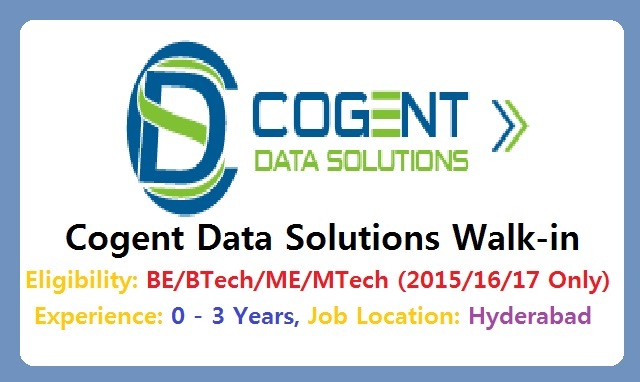 CDS-Cogent Data Solutions Walk-in Drive || Freshers/Exp 2015/2016/2017 Batch @ Hyderabad. Knowledge level in Java Fundamentals, OOPS concepts, collection, data structure, Design Patterns. Knowledge level in Spring MVC, AOP, Spring Security and Spring DI/ Spring IoC framework. Knowledge level in designing spring boot micro services. Knowledge level in developing REST services. Candidates who got trained on Java, j2ee, spring, Hibernate. Madhapur, Hi-tech City Rd, Hyderabad 500081."